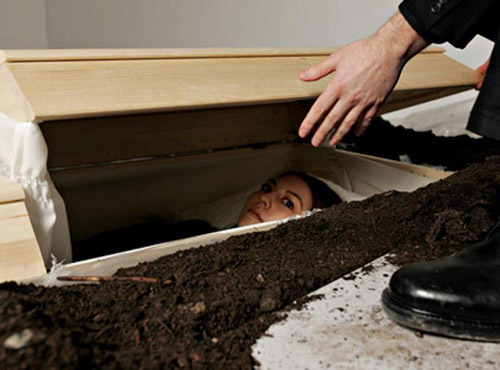 monochrom: Experience the Experience of Being Buried Alive --- in Vienna! We have the coffin. We just need you. The people present will have an opportunity to be buried alive in a coffin for fifteen minutes. As a framework program there will be lectures about the history of the science of determining death and the medical cultural history of "buried alive". People buried alive not only populate the horror stories of past centuries, but also countless reports in specialized medical literature. The theme of unintentional resurrection by grave robbers also runs through forensic protocols. Even in the 19th century it was said that every tenth person was buried alive. No wonder that the fear of this fate was immense and led - especially in the German-speaking region - to all kinds of precautions to avoid it. Various death test methods were developed, for instance. "Security coffins" with bell pulls and air hoses were patented; mortuaries were built, in which corpses were left for days to natural decay. At MUSA, Felderstrasse 6-8, 1010 Vienna. Lecture: April 27, 2013; 2 PM. Start of premature burials: April 27, 2013; 3 PM.